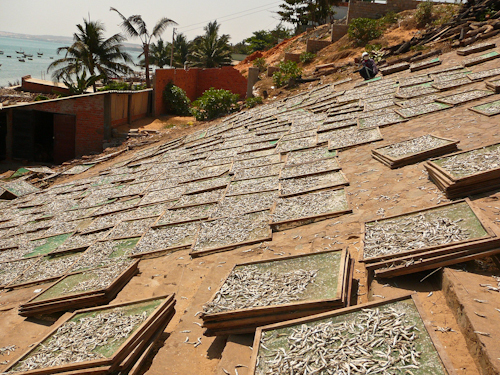 Mui Ne, on the coast of Vietnam, is a sleepy fishing village that produces a lot of fish sauce. 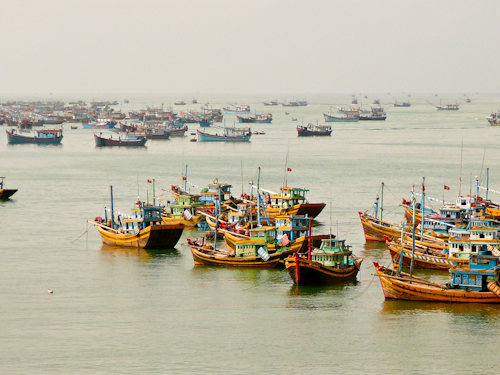 The colorful fish boats leave on the morning tide and return late in the afternoon. The hills lining the shore are filled with baskets of drying fish…yep, you can imagine the stench! I love that 1st photo! Love the colours in that first photo. Thanks for the photos Gillian. I love fish sauce, the salty taste of it and it’s really good to be a partner of green mangoes! So perfect! Hi Gillian, I can only imagine the stench, considering what opening a bottle of fish sauce smalls like! Kind of a cross between wet socks and vegemite?! Beautiful coloured boats though! I love Mui Ne – and think it could be Vietnam’s best beach. You certainly raise a case for it being the most photogenic! Great photos! I love cooking with fish sauce and thankfully it does not taste in a dish the way it smells when you remove the cap but I’m not sure how the village must smell if it’s produced there! A little fish drying stench today, means awesome flavor tomorrow.